0001: London is staying quiet tonight and we are going to bed before 5am, hurrah! Thanks to all who’ve supported us and sent us updates, we do appreciate it. Thanks for all donations to the beer fund – we may wander down to a Central London pub at some point soon and get our round in. 😉 Extra pennies muchly appreciated, your support really means a lot to all of us – we aren’t paid for this. For those of you listening to the radio tomorrow morning, Gaz will be appearing on BBC Radio 5 Live at about 0840ish to discuss the rioting. … and a topical cartoon from Vic Jeganathan! 2345: We’re going to knock off in ten minutes; London is calm. 2340: Brentford, Chiswick and Finchley all quiet and calm. Helicopter reported to be over Finchley. 2333: New Addington all quiet as far as we know. Just rumours and hearsay over there, nothing more. 2332: Unconfirmed reports of something happening in New Addington, checking that out now. 2329: All quiet on the Western Front. Hertfordshire Police reporting that all is calm over there too. 2322: All quiet in Ruislip. Ditto Wembley. Lots of police in both areas but that’s probably because they’re taking no chances when they receive disturbances of small reports. 2318: Definitely quiet out there. Any news? Tweet us @thewestlondoner and @gazthejourno. 2309: Feltham reporting that all is calm there. Not much coming in from elsewhere. Seems that earlier attempts to start the riots up were swiftly squashed by police. 2306: Reports coming in of two unexplained deaths in a house in Harlington. Probably not riot-related at all, but we’re waiting on more from that. 2304: Sky News carrying various segments on the Birmingham deaths. 2301: Everything seems to have calmed down. Could this be related to the police being granted powers to use plastic bullets? 2259: Hounslow appears to be quiet. More updates as we receive them. 2256: Heavy rain in Manchester according to Sky News weather, appears to be helping to deter any action. 2254: Southall: Gathering near the Havelock Estate, outside the Sunrise building. Police have dispersed them. 2252: Nothing coming in, we’re watching many locations including Southall and Enfield. Any updates, please sent to @TheWestLondoner. 2247: Arrests in Greater Manchester. GM Police say “If you want to cause disorder. We’ll lock you up”. 2243: Police appear to be in control in towns across London. More updates as we get them. 2239: No confirmed reports of Hertford Road. But appears any kind of crowd that may be present are not causing any disruption. 2232: Various reports from Eltham that clashes between police and people there were related to differing political groups. 2229: Reports of fire in Tottenham are apparently of a clothing factory. Not related to riots – London Fire Brigade are already there and have it under control. 2227: VIDEO: Sean Cameron in Tulse Hill has footage of police vans driving around there. Absolutely no suggestions of problems there. 2222: Lots of police in North Finchley. Meanwhile earlier reports of a factory on fire in Tottenham have been confirmed – fire brigade and police are on the scene and it’s well under control. 2220: All seems calm as far as we can see. Tweet us with updates – @thewestlondoner or @gazthejourno. 2216: No further reports on North Finchley – seems that that was false. 2213: Sky News live footage over Eltham shows nothing but police and police carriers in the area. That area’s most definitely secure for now! 2211: Sky News reporting that because so many of the arrested looters & rioters are under 18 it is unlikely that many will be sent to prison. We don’t offer a comment on that. 2210: Tottenham is quiet as far as we can see, not sure about the reports of that rumoured explosion there. Could be someone with their hearing aid turned up too loud? Congratulations XH – keep it up! 2204: The three men who had a car driven at them in Dudley, Birmingham, have all died. One of them apparently died on the scene. 2202: BBC 5 Live’s man on the ground is reporting that Eltham has calmed down now. Seems that a group of people chucked various objects at police and were then dispersed. Westminster magistrates’ court is staying open all night, reports Sky News. 2159: Police telling a large group of people to go home in Enfield. 2158: Strong police presence in North Finchley, reports of something happening there. Reports that there is a fire in Tottenham, we’re checking that now. 2154: North Wales Police are reportedly on the scene in Eltham. The Met’s mutual aid system really is working well! 2153: Staines is nice and quiet, says our man over there. Meanwhile I’ve opened the first can of many energy drinks tonight! 2152: The man who was shot dead in Croydon yesterday has been named as Trevor Ellis, LBC reports. 2151: Bush Hill Park station is quite near to the troubles reported at the retail park just east of the town centre. 2150: Enfield town centre is reported to be quiet. 2149: Unconfirmed rumours of trouble brewing in the region of Bush Hill Park station, Enfield. Doesn’t seem to be anything happening down there, though. 2147: Eltham now. Lots of police, little sign of anyone else! 2144: Eltham latest is that police are outnumbering the people causing trouble – about 80 police are present. 2141: Catford is reported to be quiet. Checking rumours from Enfield now, but initial reports there say there is a heavy police presence keeping things calm. Reportedly 50+ riot vans in Eltham area now. 2140: Eltham High Street is closed – the crowd there is now reportedly dispersing. Seems to have been a flash rather than a riot. Keeping tabs on the situation. 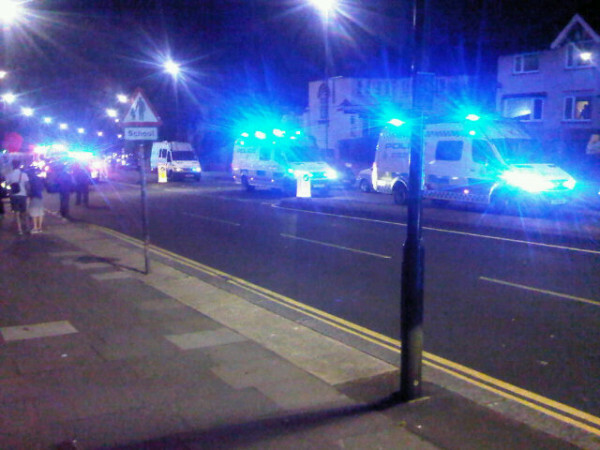 2136: Eltham latest – police have been bottled by a large group but situation is mostly under control, reports BBC 5 Live. 2134: Large numbers gathering in Eltham but no reports of clashes there just yet. Heavy police presence too. Meanwhile in Catford several reports are coming in of a disturbance there, we are confirming that now. We will be a few minutes getting this page up and running – my utmost respect to Xenia for keeping Twitter and Facebook going! Oh well. I love your updates so I’m pleased you’re helping out. Hoping for a quiet night. Have to say that you guys are amazing – and a much better source of news than BBC and Sky put together. Good work fellas! I agree. And if gaz is not offered a journo job by the media then there is no justice left in england. I am re blogging this, as i have done for the last two days, reffering everything back here. I also offer some opinions on my blog and twitter, will be quiet tonight though, busy. You guys are doing excellent work, shame there is never anything to report from Northampton. There are lots of police sirens in Brixton town centre but that’s hardly unusual. there’s a fire right now happening in seven sisters – NO IDEA if it’s related to riots or not? trying to find any info on the web but nothing’s coming up. Hoping it’s just a coincidence? At least they gave you a bit of an evening to enjoy a beer or two and something to eat! Here’s hoping it doesn’t come to much and you can get an early night! Ok, here we go again, thought I would be able to sleep peacefully tonight! You guys are far better than any of the news websites. Reading from Dublin! Sorry to hear you’re having to work again tonight, Gaz. Hope you enjoyed those Buds, anyway. It’s too bad it took the police three or four days to decide to come out in force. Had they done it after the first night, it could have saved a lot of peoples’ property. Southbury Road Road in Enfield I’m told isn’t quiet. Your doing a fantastic job…shame you didnt get to enjoy a night off! We can smell smoke and hear choppers in the air and sirens here in Bexleyheath. Have not been able to find out whats happening (certainly dont intend in going out to look). Keep up the great work, this is quite simply the best and by far most accurate source of updates on the net far as i see it. The crowds in eltham include BNP and EDL trying to start a race riot !!!! Idiots !!! Nice work here mate, I don’t think you will be needing many Energy Drinks for tonight I think tonight and tomorrow will be quiet but I don’t know if you have seen this, I was reading some other news website and found this http://a.yfrog.com/img616/1580/v7jiq.jpg it’s about rioters meeting up on Friday, so stay tuned for Friday. any further news in north finchley?? I hope that you guys are the future of British journalism. You’re brilliant. To everyone who has relied upon this place as a conscientious, actively verified source of news, please sling them a couple of quid via paypal – it’s really easy, and it’s good for the future of news. Well said Nick, it really is very easy!! And I have emailed both sky news and bbc news with a link to The West Londoner and suggested they employ these guys and get some actual ‘Breaking News’!! Thank you so much, forewarned is forearmed. Have felt so much safer knowing what is going on and where. Thank you sterling work from you all. I have donated not much i know. wtf does your website normally do? i feel obliged to check you out on a regular basis afer your sterling work this week. 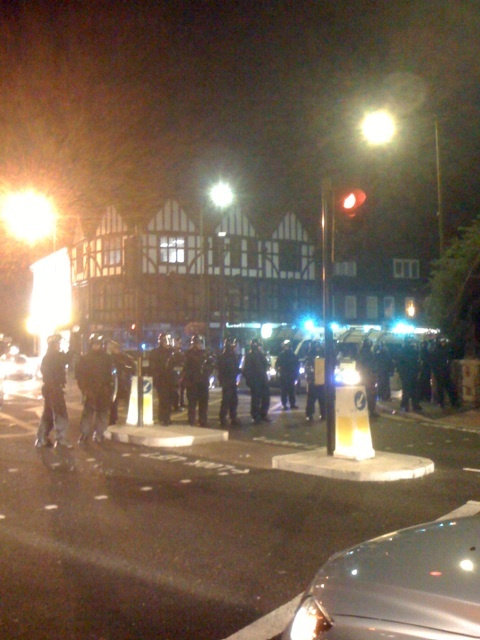 West London news – site wasn’t actually live until the first riots liveblog went up! Any more updates on North Finchley?? ‘Old news now but the three men who had a car driven at them in Dudley, Birmingham, have all died. One of them apparently died on the scene’. Unbelievably callous – sort it out guys. thanks for the updates! Just heard from a friend that people were at it again at our Eltham high street. I do not have sky news and could not find information anywhere else so thank you. I could here lots of Helicopters and sirens but all seems a bit calmer now. Let’s hope it is the end of it! it has been great to have facts and not rumours …. I too am saying thanks for all ur work……..have mentioned you to lots of people…..hopefully you’ve built a solid fan base now. Echo the previous comment. You’ve done a brilliant job – the best source for RELIABLE info. Thank you. The Government e-petition website (http://epetitions.direct.gov.uk/petitions/7337) seems to have fallen over with the sheer number of people trying to sign the petition to remove benefits from rioters! As much I appreciate your selfless and hard work, I’m going to have to agree with Jack Hackett (#32). What was said may come across as insensitive to others and I’m sure that’s certainly not what you intend, especially during what’s happening as of late. Fair point well made – sometimes it’s possible to get too detached from a situation. My apologies to all, certainly didn’t intend to come across as callous. Hearing police sirens around every ten minutes in Walthamstow, don’t know if anything’s happening here. seriously something is going on in sw4 area, sirens and helicopters, it was v quiet last night. All you guys rule! You’re my main source of info (as well as my mates keeping me posted!) You’ve been excellent! Thanks to you all! Thanks for all your great work guys!! I’m English but I now live in New Zealand. While all my family in England are sleeping It’s been very reassuring to be able to follow what’s going on in my home town (even though I am supposed to be working). Just wanted you to know it’s not just the people in England that your updates are helping!! Thanks for the amazing coverage over the past few days guys! The major news organisations seem unable to keep up with events but you seem to be on the ball, good job! I think I will be frequenting the West Londoner a lot more. I have posted my feelings on all this on other sites, with no feedback, but thats cool, il share here too anyway. And il try to cover everything in short as possible. this aint about race, religion, poverty or whatever else you wanna blame all this on, its very simple. i have lived in london all my life, and grown up in rough areas, and gone to tough schools, and had my fair share of stuff to deal with, and lucky escapes from potential dangerous situations, as have others. the youth of today are far different than the ones when i left school around 1993, it was very rare to hear about people getting stabbed at school, and while that kind of violence did happen, along with gun related crime etc, it was quite rare, and usually if you didnt go looking for it, and run in circles that you knew were trouble it never really affected you, nowadays at schools they dont even report all the incidents that happen, and beating, drugs, stabbing etc, happen very frequently at schools, its even more common on the streets, and most people have become conditioned to news we hear, though TV and friends and family when we hear about people getting stabbed, mugged, drugs, guns the lot. i wont say where i live, its a rough north london estate, and like most estates etc we have our gang of kids that terrorise the shops, and people around here, not all people, but the people who are vulnerable and who are in fear. the main road thats near me, regulrly has troubles with these kids, not much different to these riots, just on a small scale, running in, trashing the store, beating up the shop keepers, smashing their windows in etc etc, and also like the riots, they take pleasure in taunting the police on a regular basis, then disppearing into the maze of back streets and alleys that they know all to well, even if the police catch them, with our present soft laws they dont care, and so it all continues. their mentality like alot of others involved in these riots, as we have heard themselves say, is “i dont care” “if i want something, i take it” “i dont give a f&*k what people think” etc etc is thier general attitude to life. these riots were basically a case where every body that is like that, thought if we all rise up at the same time they cant do a thing, and you know what, what the last several days have shown us, is that yes they can get away with it, and after this calms down, who will you say won? dont try and tell me the police did, or anyone else. these kids did, and they know they did. and now they know this, do you think they wont come back for more?? i know this will upset some people, but in a way i was hoping the riots would continue, and sort of reverse physiology effect, if we the people wont stand up and demand a better life, and better, safer place to live in, then let these people cause the reaction thats needed to change things for the better, for us. we have already seen how these criminals have been dealt with, 90% are under 18, so no jail terms, i dont need to tell you more about how SH%T our law system is. now if there was more riots, it would really push the people and hopefully the government to make drastic changes in the law. so if you steal, and its your second offence, 1-2 years jail. if you do worse and beat up people or even worse, give them an even bigger sentence. get more police on the streets instead of cutting them down. build more jails to house them. have a better reform system in place so the people who really do want to change their ways are supported. i could say more but i think yo get the idea of what im saying. nothing will change when all this calms down, and believe me it will happen again, only this time the people who do this, are more empowered in their attitude, and perspective on their already warped sense of society. this sudden awareness on what these people are like, has always been there, for a while, but as long as its not you getting mugged, not you thats beaten up, or stabbed, then you just accept its a part of life and the world we live in. everyone needs to deal with the root cause. I agree with most of this…apart from wanting to see the riots continue, I don’t agree with that because things could have gotten really drastically out of hand even more so than they did. Other than that though i think you are spot on.The police did not win. What i find really frustrating is that they could have won, if they were allowed to use force at the first riots at tottenham they could have dealt with the situation there and then and it never would of escalated. So on that front the do gooders who took the power away from the police are mostly responsible for the riots that followed. It only escalated because the gangs and kids saw that they could get away with it and then everybody else joined in from all walks of life cos they saw that there were already too many people doing it and the police were just letting them…..(everybody that doesn’t have morals that is). These kids and gangs have done enough shopping for a few days and they aren’t stupid. Why would they carry on when the police presence is at its unsustainable highest level…they will wait until it calms down and then have another party. Aside from the situation in Tottenham which i cant comment on,this wasn’t an explosion of aggression due to any build up of frustration, or any sort of protest, this is now an attitude and way of life for A LOT of young people in London and has been for some time. The only difference is that this was done with extra bravado cos it happened all at once, the police were stretched and couldn’t do anything so it was magnified. The root cause everybody is looking for, (aside from the gross inequality in the distribution of wealth which i cant see changing anytime soon unfortunately) it is largely the Governments fault for encouraging and helping broken families by giving extra benefits to people who are still immature and cant look after themselves let alone a child…but the more children they have, the more money they get and a guaranteed place to live! It is not these kids fault they have been born into this situation, but unfortunately i don’t think there is much hope of them changing there attitudes once they have reached 13/14 unless you pull them out of there environment, for most of them at least. We can only look to getting it right in the future. I wont go into my thoughts on that now though. As to your thoughts on more police well it would be nice but costs money and really isnt necessary…what we need is the police to be able to get tough and do what they need to do without being accused of brutality every 5 mins…I don’t worry about them having too much power, they wont get away with anything totally outrages in todays technological world they are always being watched, much more so than the criminals, cos they come in a blaze of noise and flashing lights. So i say…would the clueless people who argue against stronger enforcement measures for the police please F off! thank you. Lots of sirens in Ilford currently. Any idea what’s going on? Gaz Corfield is the maaaaaan!! InfoReader and Moses are right I agree with everything you said, it was a long time coming, I wonder if they will strike again in weeks, months, or years, who knows? Also I read somewhere that this the young peoples equivalent of what the bankers did (I don’t agree with either btw) these kids cost the country abortion £150 million by now whilst the bankers cost us billions. People lost businesses and homes in both situations, so who is worse? 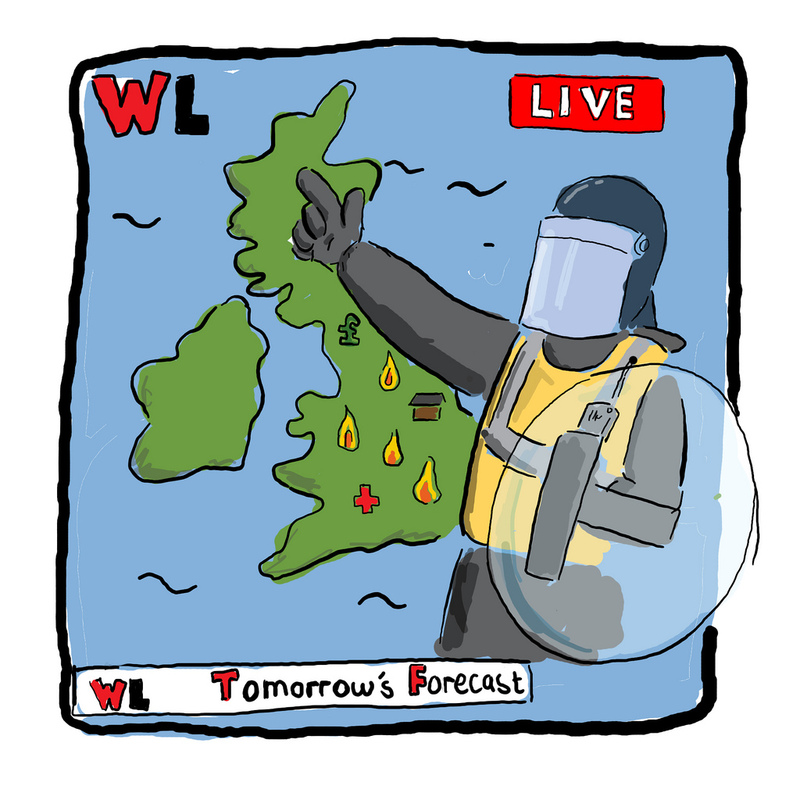 Round-up of last night/this morning Tonight seems calm – stay safe!